The series: Texas leads 27-10. Texas has won last 13 games. 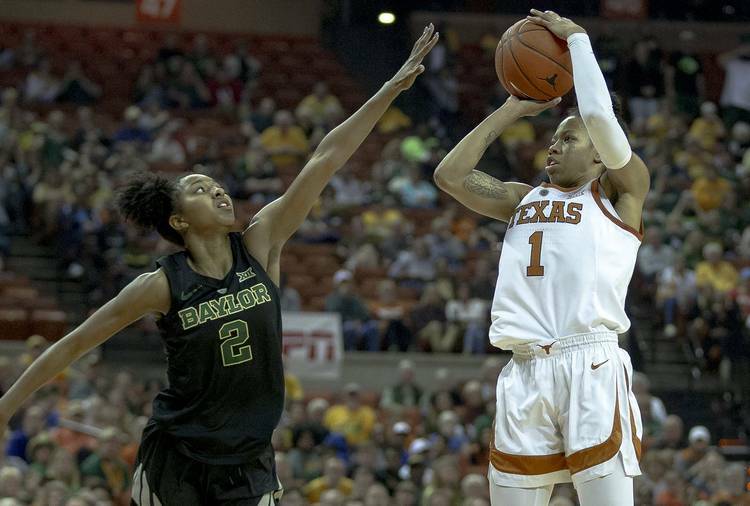 About the Longhorns: Texas defeated Kansas 62-43 last month in Austin. Sutton had 18 points and six rebounds while Holmes contributed 15 points on 7-of-10 shooting and eight boards. … This is UT’s first game since losing a 74-68 decision to top-ranked Baylor on Monday. … Freshman Audrey Warren who has missed three games with a concussion and nasal fracture, might return for the game. If so, she will wear a protective mask to cover her nose. … The Longhorns rank fifth in the country in rebound margin, averaging 11.3 boards more than their opponents. The have won or tied the rebounding battle in 20 of their 23 games. About the Jayhawks: Kansas is coming off a 72-62 home overtime loss to Kansas State on Tuesday. KU was outscored 12-2 in the extra period. Richardson scored 16 points and Lyons 15 in the loss. … Kopatich ranked among the top five for 3-point field goals made by a freshman with 45 (4th), sophomore with 53 (3rd), junior with 69 (2nd) and is on track to make the most 3-pointers by a senior in KU history. … Kansas has four different players shooting above 80 percent from the free throw line during conference play: Chelsea Lott (97.5 percent), Kopatich (85.2), Lyons (81.3) and Mariane De Carvalho (81.8).